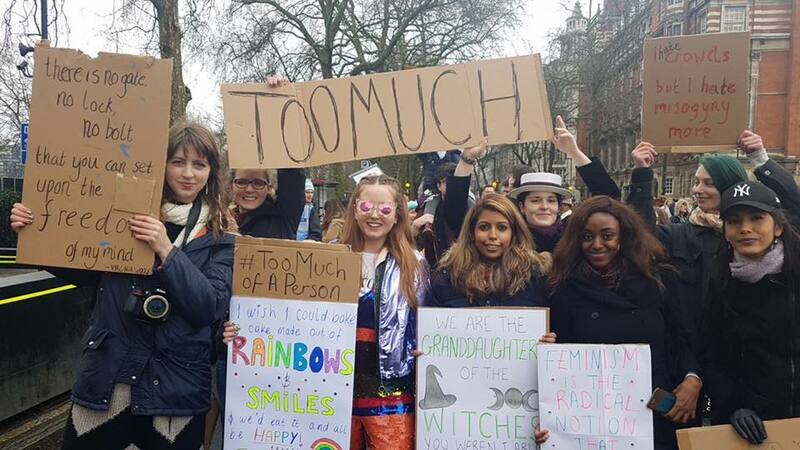 Too Much of a Person - That one time Anne Robinson said I was "too feeble"
That one time Anne Robinson said I was "too feeble"
On a brisk March morning in London, the ‘Too Much of a Person’ contingent set out to join #March4Women 2018 which was calling for an end to gender-based discrimination and violence in workplaces all around the world​. 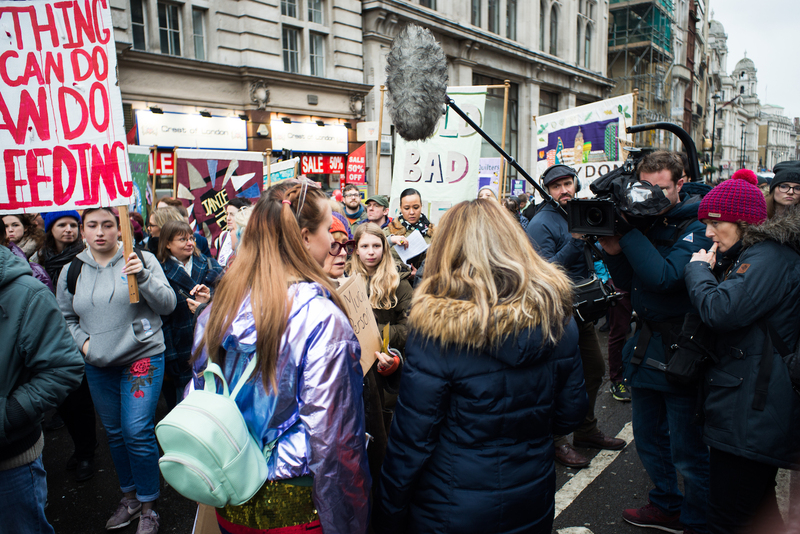 As the march went on, we noticed women being storyed for a BBC documentary on ‘equality’. D mentioned to me that the storyer was Anne Robinson. We saw it as an opportunity to raise awareness for our project, so I charged ahead and introduced myself. Anne asked me if I was a “WARRIOR”. I hesitated, the Product Manager in me wondered what the criteria (success/failure metrics) were to qualify as a warrior? The dreamer within me had already played a montage of me as Wonder Woman saving the world in my head- it was glorious. “What do you mean you think you are? You either are or you aren’t! !” She interrupted. My teammate E, confidently responded that she was a warrior. Anne then demanded that we provide her with evidence of how we were warriors. What risks had we taken recently? Do we ask our male colleagues what they earn and demand our employers pay us equally? Would we be marching into our bosses offices the next day demanding a pay rise? I had done all of those things. When I realised my male colleague was earning 12.5% more for doing the same role, I asked for a raise. When my employer refused to address or resolve the issue - I handed in my resignation. I did not have another job lined up but I refused to continue being undervalued by them. However, I was in a fortunate position where I could make that decision. There are several others who are unable to do so and they do not deserved to be judged harshly for circumstances beyond their control. Unfortunately, during the inquisition my mind went blank mind and I was unable to relay these experiences. Instead, E and I mumbled that “we try our best”. Anne was not impressed - “you should be demanding more money than the male employees for doing the same job!! I did exactly that when I was working.” I vehemently disagreed with this sentiment. I don’t believe anyone should be paid more/less because of their gender. The purpose of this march was to promote equality not misandry. My responses wouldn’t have mattered either way. Her questions were specifically crafted to evoke a certain response. Anything that didn’t fit the narrative would most likely be dismissed and edited out. It became glaringly obvious that the documentary’s agenda was to belittle efforts to achieve equality by the “modern woman” and that we shouldn’t complain because “it was much harder for the older generations”. I refused to sign the release form and chased the production company to ensure that I wasn’t included in the show. I couldn’t be a part of something that validated misogynistic viewpoints lurking in people’s minds and further fuel misconceptions of those striving for equality. This kind of “documentary” does nothing to enlighten viewers, it was designed to garner publicity by aggravating feminists and validating misandrists. It also perpetuates this idea that the onus of achieving equality must only lie with women. We have to ask for it and that if we don’t get it, it’s our own fault. Corporations should be held responsible for unequal pay of employees based on gender. Those that make the workplace a toxic environment through sexual harassment or violence should face the repercussions and be punished for their behaviour. Anne Robinson branded me and the Women’s march as “feeble” and displays complete obliviousness to her privilege that gives one the freedom to take those risks. In reality Anne, ‘The Trouble with Women’ is that you are the weakest link in the fight for equality. Goodbye.